At the end of the Second World War, Barnardo's was at a low ebb. With the Girls' Village still requisitioned and evacuees being returned from their wartime foster-homes, the organisation was struggling to find places for all the children being sent to it. It was also short of staff, and the wages it offered did not match those of other employers. And despite its efforts to update itself, Barnardo's image appeared increasingly old-fashioned. The war had created considerable upheavals for children, especially those without families, and there was growing concern about their situation — no doubt heightened by the major welfare reforms that were in progress at the time. A committee was appointed, under Miss Myra Curtis, "to inquire into the existing methods of providing for children who... are deprived of a normal home life with their own parents or relatives; and to consider what further measures should be taken to ensure that these children are bought up under conditions best calculated to compensate them for the lack of parental care." The committee looked at wide range of children including the destitute, the homeless, war orphans, the physically and mentally handicapped, children removed from their families by the courts, and children awaiting adoption. Its conclusions, in what became known as the Curtis Report, had a huge impact. For children without parents or a satisfactory home, adoption was proposed as the best option, with fostering the next best. If a child had to undergo institutional care, then this should be in small homes of no more than twelve children and ideally no more than eight. Children in such homes should be encouraged to maintain contact with relatives and to develop friendships outside the home. Brothers and sisters in care should be kept together. The Curtis Report's proposals formed the basis of the 1948 Children's Act. 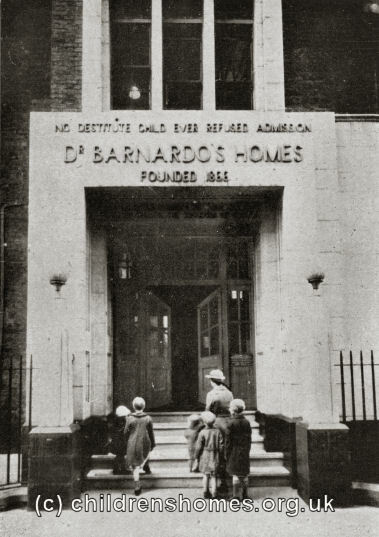 Although legal adoption had been possible since 1926, it was not something for which Barnardo's had shown much interest, still seeing itself as providing the substitute family for those that came into its care. Nonetheless, in 1947, Barnardo's became a registered adoption society. Under the 1948 Act, local authorities were required to set up a Children's Committee and appoint a Children's Officer to promote the welfare of deprived children. Instead of acting autonomously, charities such as Barnardo's now had to take their place in a national system of child care under the ultimate authority of the Home Office Children's Department. Other changes came in the wake of the Curtis Report. There was a reduction in the amount of time that children in the homes spent doing household chores. The long-held notion that domestic service was the natural destination for Barnardo girls was also forced to change. There was a moved towards making all the homes mixed, starting with the main sites at Barkingside, now renamed the Children's Village Home, and at Woodford Bridge, which became the Children's Garden City. Barnardo's administration, based in what was viewed as the hallowed ground of Stepney Causeway, was proving increasingly antiquated and inefficient and much of the charity's property was ageing and dilapidated.